Drawing of a monument to Abraham Blackleech Gent., who died in 1639 and his wife Gertrude in Gloucester Cathedral. This is located at the east end of the north aisle of the Cathedral. The two recumbent effigies are most likely by Samuel Baldwin, are of good quality with carefully carved hands, faces and costumes. 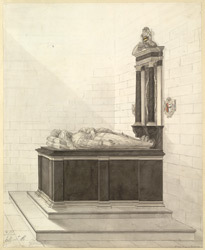 As can be seen in the drawing, the tomb chest is of black marble. The tomb chest backs onto the walls, and has two black marble pilasters, and the top has a cartouche of arms.